After an amazing day in Traverse City, we headed back to Grand Rapids for the night. We couldn’t find a hotel under $100 up north,so we came back as far as Grand Rapids and found a Red Roof Inn for not even half that much. After getting settled, we both got a little hungry, so we hoped in the car and started heading towards downtown. First, we wanted to check out Fresh Market, but it was too late and they were closed. That would have to wait until the next morning. For some reason, our GPS took us the long way back to the Interstate and we ended up on Beltline Road. 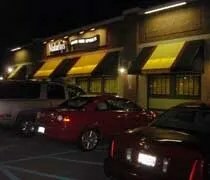 Just before we got to I-96, we hit this bar that looked like a chain, but wasn’t a chain we had ever heard of. I-96 West was closed at that interchange, so we had to drive around and come back. On the way back, we just decided to give Malarkey’s a try. Really, all we wanted was a drink and an appetizer, so why keep driving when there was a place right here. Earlier this summer, I was watching an ABC program when I saw a promo for Good Morning America Weekend. I usually tune out because who wants to get up early enough on a Saturday to watch GMA? This time I paid attention. Not because there was some important news item they were teasing. What happened is that they were teasing the results for the voting for the Best Ice Cream Shop in the country. The winner of that contest? Moomer’s in Traverse City, Michigan. 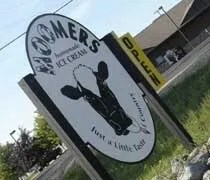 Since we were planning a trip to Traverse City, we made sure that Moomer’s was on our list of places to go. We knew while eating dinner at Boone’s Long Lake Inn (review HERE) that we needed to save room for ice cream. Our plan was to eat dinner, grab some ice cream then head back to Grand Rapids where we were spending the night. We both ate quite a bit at dinner, but we were not going to leave the area without a stop at the best ice cream shop in America. Whenever we go on a trip, I like to find the place where the locals go for a meal. You can always find good spots in the tourists hubs as well, but it’s those out of the way places that a tourist might have a hard time finding where the real gems are. 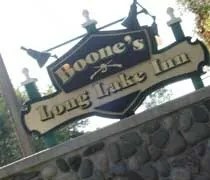 Boone’s Long Lake Inn came from a recommendation from Ang who said she and her fiance will find a reason to drive to Traverse City just so they can go to Boone’s. That was a good enough recommendation for me, so we headed out of town to find Boone’s. Boone’s is located a few miles outside of town on Secor Rd. I damn near missed the turn for the driveway. The sign came up on me pretty fast, but since there was no one behind me, I slowed down in a hurry to make the turn. The restaurant sits at the end of a short drive. When we got up the hill, we came into a huge parking lot that was pretty empty. We were pretty early for dinner, so it was questionable whether we would even be able to get a meal here. There’s a sign posted on the outside of the restaurant with the hours and they just opened for dinner about ten minutes prior to our arrival. When we moved to Michigan, J’s mom was insistent that when we started seeing Honey crisp apples on the shelves we needed to buy them. We saw some the other day at the Select Michigan Farmer’s Market, but didn’t buy because we were going to be gone for the weekend. 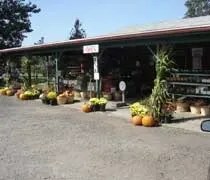 I figured Traverse City would hae a plethora of farm markets and the one I ended up finding was Gallagher’s. 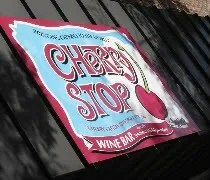 Well, I guess would couldn’t actually go to Traverse City without stopping in one Cherry related tourist trap. When we were waiting for our meals at The Cooks House (review HERE), I grabbed a Traverse City dining magazine that was sitting on the window ledge. In it, they had ads and articles for a number of businesses in the area. 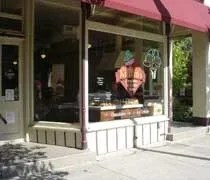 J noticed one called The Cherry Store which was just a few blocks from where we were. We were going to walk around downtown anyway, so we just kept an eye out for this store.